A meat lover’s haven. 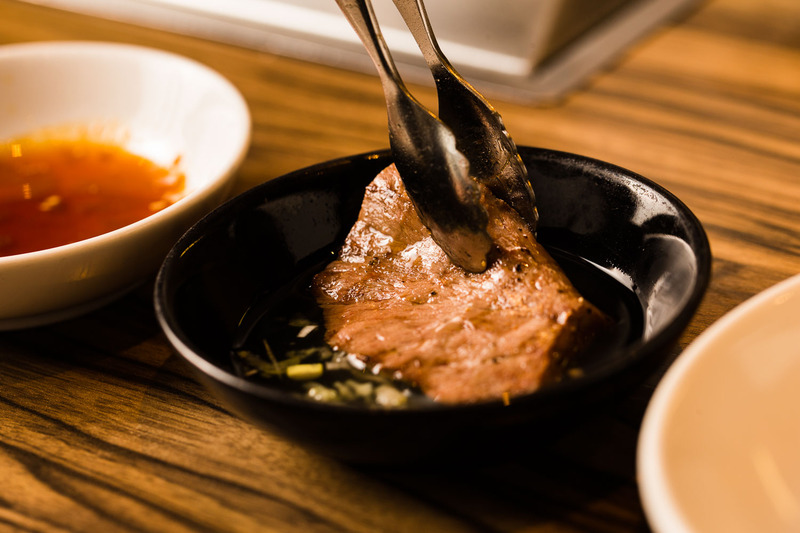 Yakiniku Jambo is among Tokyoites’ favorite Korean BBQ, serving top Japanese black wagyu, drizzled in family-secret sauces. Prepared by true meat experts, every slice is grilled to perfection and complemented with delicious sides. Come hungry to flavor the full assortment of the premium beef, including some rare cuts like the upper rib. The restaurant was founded on X-mas Eve of 1988 in Edogawa by the parents of the current owner Norimitsu Nanbara. They opened the restaurant to take on the legacy of their mother who single-handedly ran a BBQ joint for four decades. While a small and local eatery in the remote neighborhood in its early years, the restaurant took a big leap when young Nanbara took over and dedicated to serving top-quality meats like A5 Kuroge wagyu. In addition to the meticulous selection of beef, he went on to expand the “hidden” menu of side dishes like wagyu sushi and tartar. 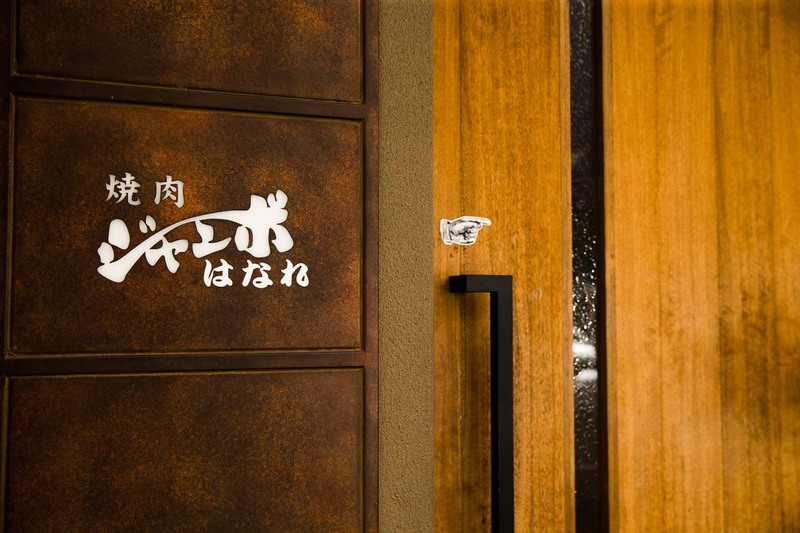 Opening a second branch in Hongo in 2010, and later Yakiniku Jambo Hanare in Shirokane in 2013, the restaurant quickly became one of the most popular BBQ places in town. Located in the high-end downtown neighborhood, Yakiniku Jambo Hanare is bustling with meat lovers craving for another tasty evening. 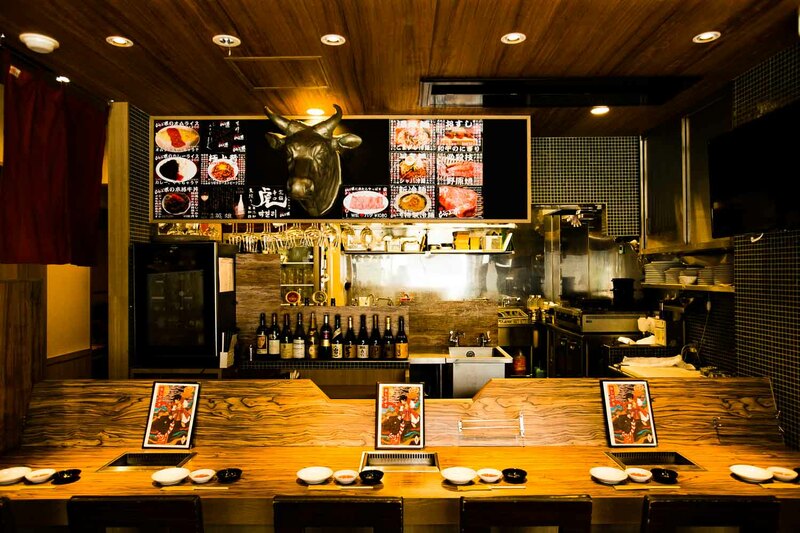 Behind the main counter stretches a big open kitchen where you can see Nanbara and his staff working away with big slabs of meat over the hot plate. There are also three private rooms in the back. As you inhale the sweet and garlicky smoke, you simply can’t wait for the first bite off the burning grill. The BBQ menu offers a dozen choices, covering all parts of the cow from shoulder to rib to even the tongue. 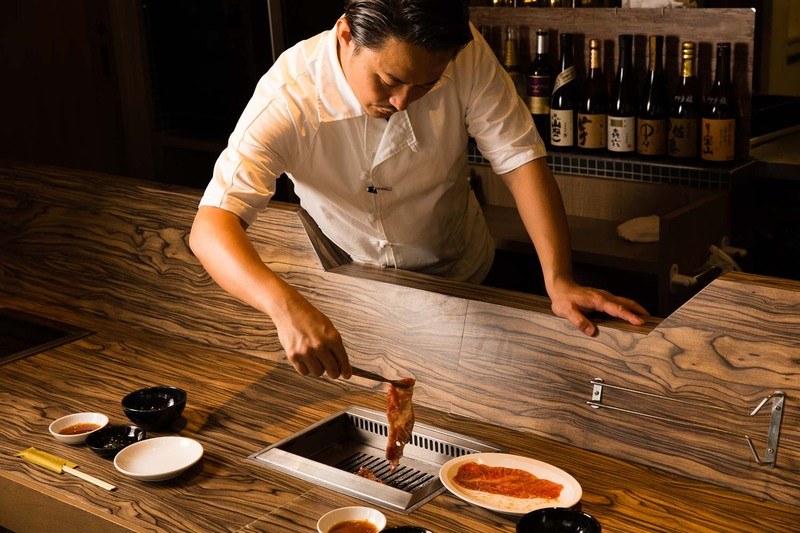 The sliced meats are dipped in a special sauce as each order is placed, and brought to your table to be grilled on the hot plate right in front of your eyes. “It’s really about the sauce,” Nanbara says, when asked about what makes Yakiniku Jambo unique. Based on his grandmother’s secret recipe, he prepares three sauces to match the different meats. The soy-based sauce has a deep flavor from kombu and bonito dashi, while the salt sauce is lighter with a hint of sesame oil and pepper. Citrus sauce offers a refreshing alternative, made from bitter orange and kabosu limes. 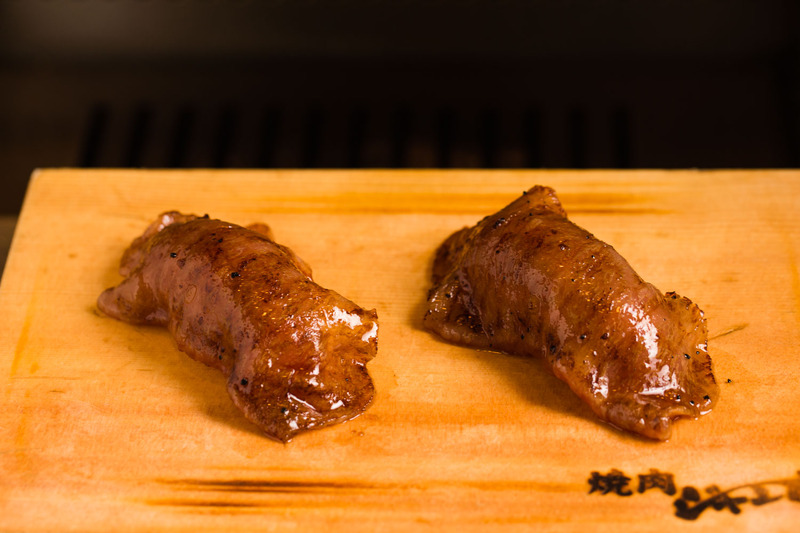 The most popular meat, Noharayaki, are these large but thin slices of soft and tender sirloin, marinated in a soy-based sauce with a hint of miso. Grill the marinated meat just lightly on the grill, and dip in raw egg while hot. The creamy texture and sweet flavor is simply addictive. 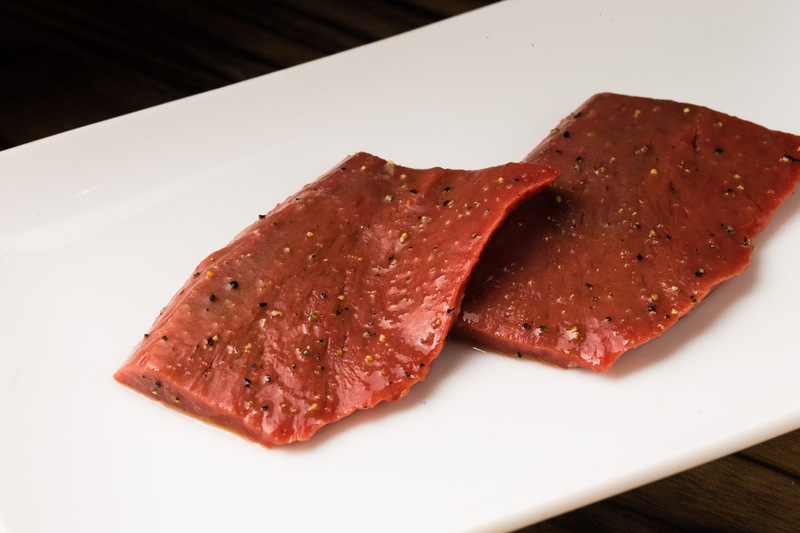 At Jambo, you are invited to flavor the rarest beef delicacies. Zabuton, which means traditional Japanese sitting cushions, is a prime 3-4 kg part of the chuck roll that simply melts in your mouth. 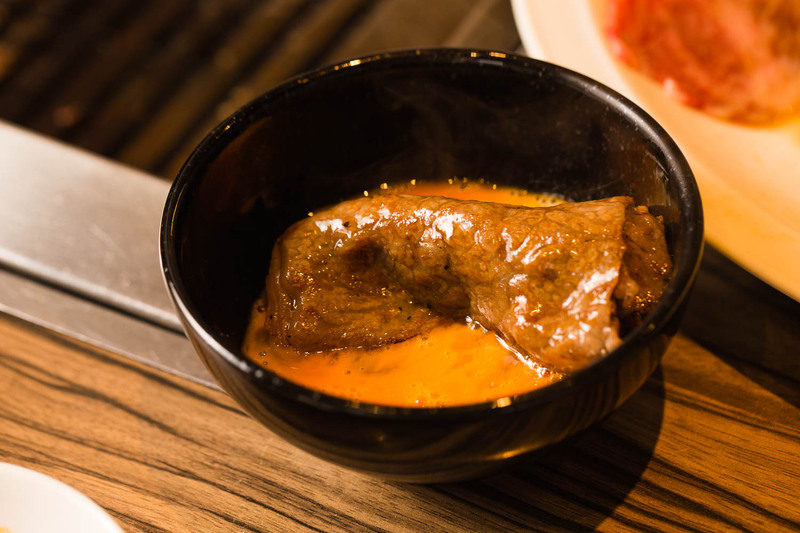 Baked crispy on the outside, hiremimi, the “ear” of tenderloin or upper rib, is even a smaller 800g cut of the beef. Hatsu, a section of the heart that can also be enjoyed raw, is the best way to tell the quality and freshness of the beef. Dressed simply with salt, pepper, sesame oil, the meat has great texture and depth of flavor. Misuji is another tender part of the cow, just below the shoulder and tastes great with soy and garlic. To make your meal even more memorable, remember to call in ahead to reserve a piece of Chateaubriand steak. Cut into the best thickness for that day’s meat, the steak is slow cooked over the grill for over 20 minutes. Enjoy the sweetness of the perfectly marbled meat with every bite. 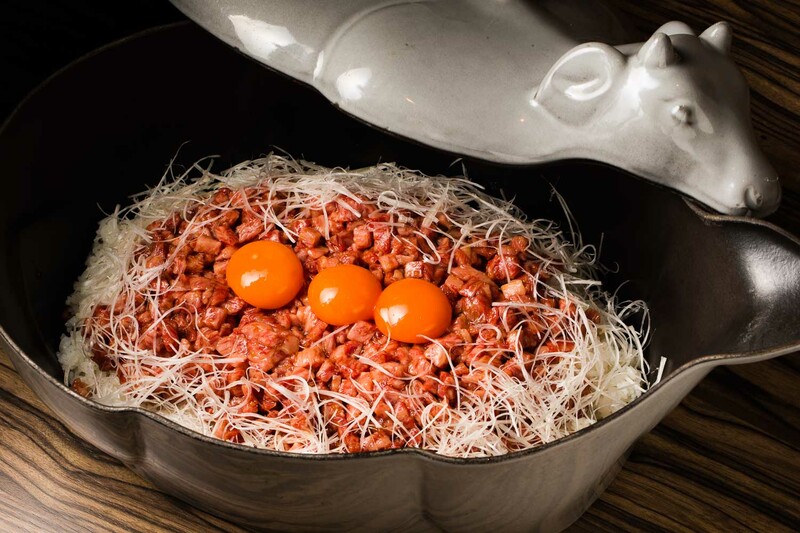 A must-try from the “hidden” menu is yukke rice, where a hot bed of rice is covered with beef tartar and raw egg yolk. For a six-person serving, the dish is served in a cow-shaped oven dish. Wagyu sushi is another recommend where the sliced beef is only grilled on one side before placed on top of a morsel of brown rice. The delicate balance of the rich meat and drier grain is superb. There are also other classic homemade dishes like omurice and curry rice, all family recipes that have been passed down from Nanbara’s parents. 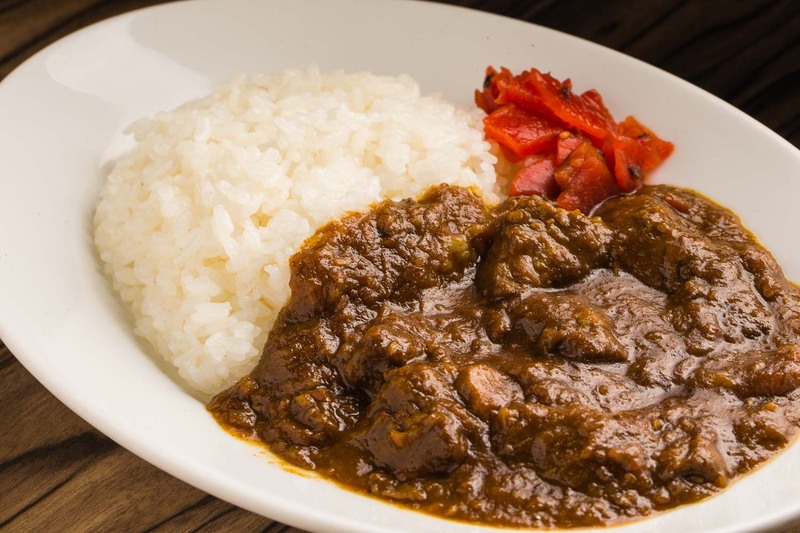 The curry rice, with big chunks of meat, is a favorite for many. 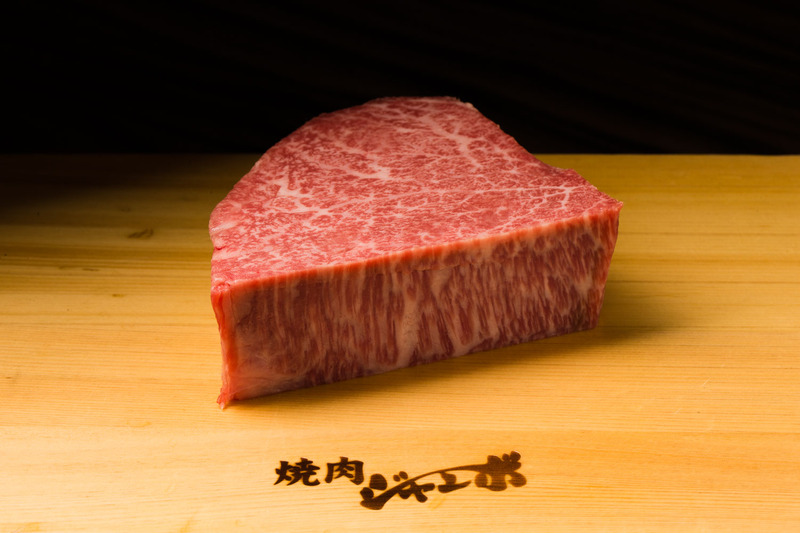 All wagyu used are A4 or A5-ranked strips, sourced from the best farms across Japan. Everyday, various producers bring their best cuts to Nanbara for his approval and purchase. Vacuumed packed, the meats can stay fresh for as long as a week although most batches get used up in a couple of evenings. Every slice is adjusted and prepared based on the condition of that particular slab of meat. Nanbara was in fifth grade when his parents began Yakiniku Jambo. While he grew up watching his parents run the restaurant, he first pursued different careers such as hairdresser and radio broadcast. “I’ve always liked the art of creating something,” he explains. At age of 26, he decided to take on the family business, which at that time was still a small, local joint in a remote part of Tokyo. 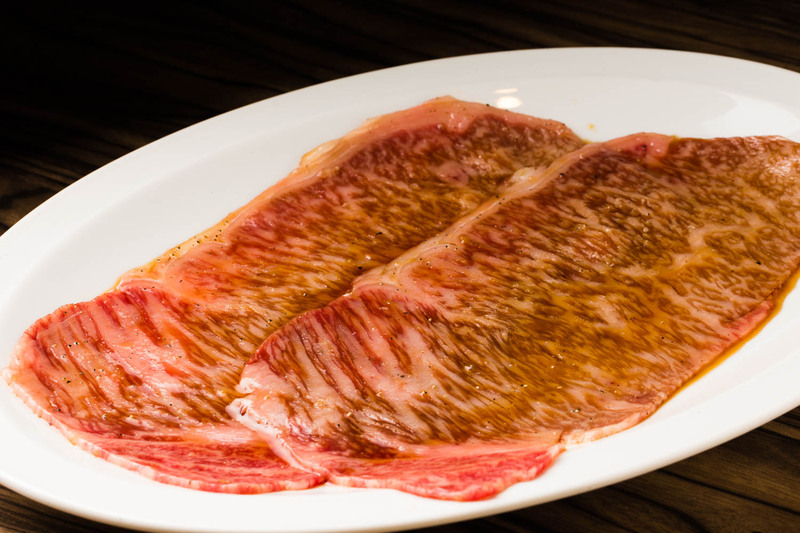 Riding on his passion to make it into a one and only restaurant, he focused on offering top-quality wagyu beef and developing an attractive menu of side dishes. It didn’t take long for the word to spread, turning Yakiniku Jambo into one of the most popular Korean BBQ restaurants in Tokyo. 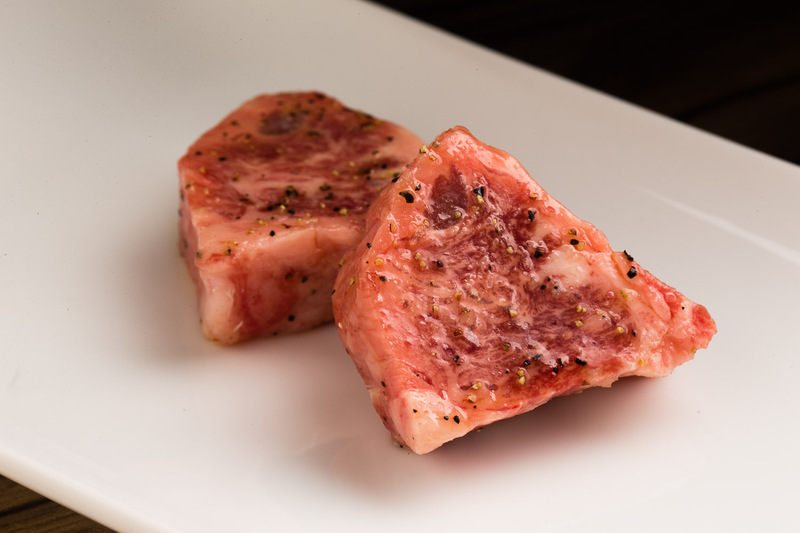 “There are so many delicious wagyu brands besides the most famous ones,” Nanbara says. His network among Japan’s best producers and his depth of knowledge about beef put his restaurant in a different league. Outside work, he spends a lot of time tasting different kinds of cuisine. A serious wine lover, he also enjoys collecting rare vintages. 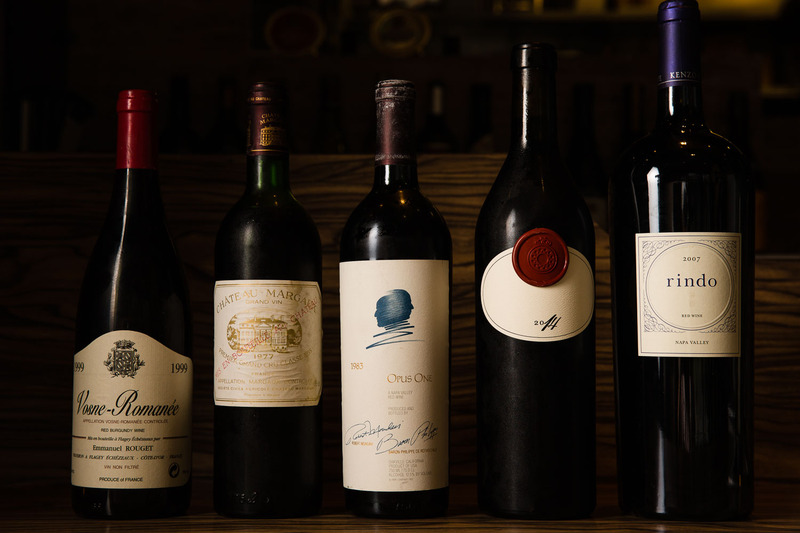 Napa wines have proven to be a perfect match to wagyu beef. Among them, Nanbara favors wines from Kenzo Estate. He also selects top-rated vintages like Opus One. 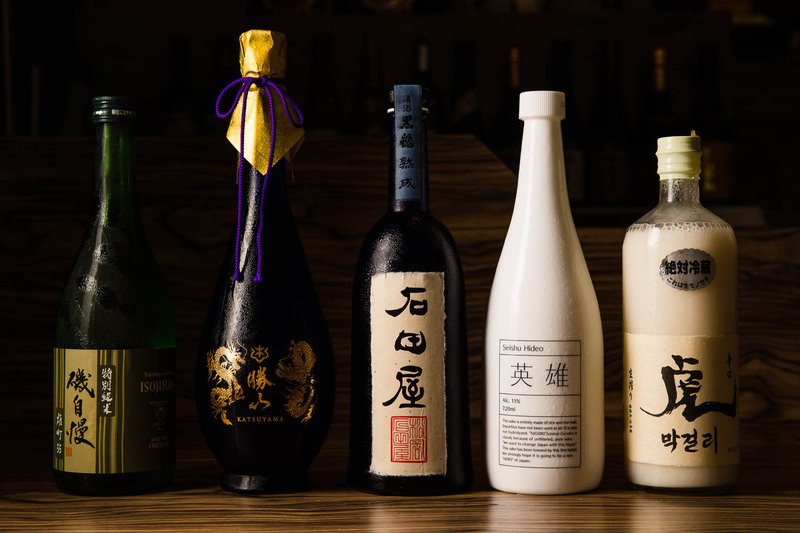 The sake selection is equally impressive, including high-quality brands like Ishidaya and Katsuyama. Another popular pick is Hideo, a low-alcohol, milky sake that resembles Korean makgeolli and goes great with meat.